The only problem with MagicBands. They are plain. Bo-ring! I mean, I suppose they are "simplistic"....if you're into that sort of thing. Use masking tape to tape off the grey edge of the MagicBand. About 1 inch above and 1 inch below Mickey, paint an arched white line. Use white paint to fill in the space between the lines. Center a dime over Mickey and trace the circle. Use blue paint to fill in the circle, leaving the Mickey emblem white. Next, use a quarter centered over Mickey and lightly trace the outline. Use your paint brush loaded with red paint to follow just beyond the traced line. Fill in the area between this line and the blue circle with red paint. Finally, trace the outer red ring using red paint. Use the photo as a guide for what your band should look like. Once paint is completely dry, insert the tip of the sharpie marker in the groove around mickey and trace the outline of the mickey symbol. 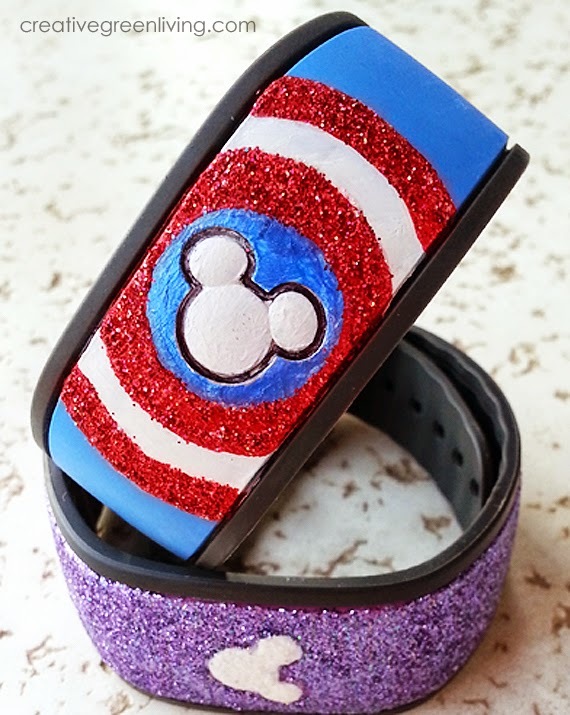 To give your MagicBand a little more pizzazz you can add glitter once the paint is dry. Use a thin tipped paintbrush to brush glitter Mod Podge on the red stripes. While the Mod Podge is wet, shake red glitter onto stripes and tap off. Set the bracelet aside to dry before brushing off any remaining lose glitter. Seal the glitter by painting an additional coat of Mod Podge over the glittered areas and allow to dry completely. See more Disney posts here! You know your kids will feel like the bomb going to disney with these on. What a creative idea. Such a cute idea! 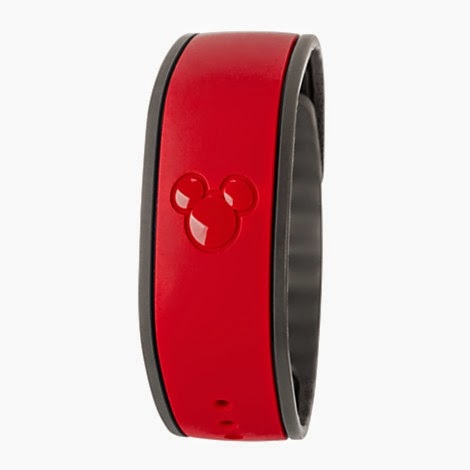 We've never gotten magic bands, but this is a super cool thing to try for our next trip to Disney! That is a cute idea. I never thought about decorating my MagicBand other than the charms they sell. 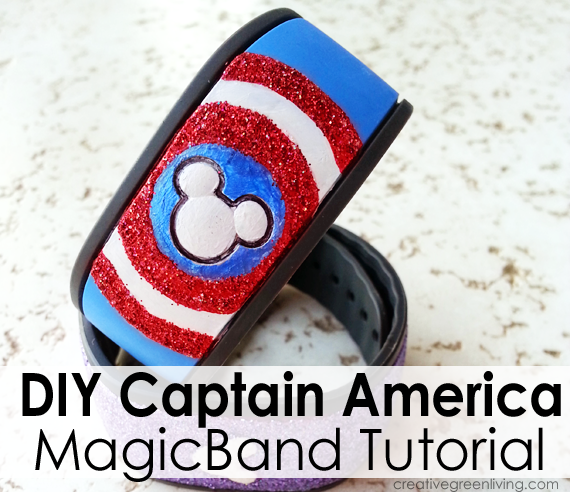 My son would love a Captain America magic band! You are SO creative to have even thought to do this. What a great idea! I love the idea of personalizing them! Never would have thought about doing that. This is AWESOME! I never thought about decorating them! Great idea! So cute! Love the Captain America one! These are so cute! You have taken a relatively nondescript MagicBand and created truly magic bands. My younger nephews would love the Captain America bands! Oh that is a cute idea. I have to go dig mine out. Oh I hope that we can get some of these bands one day! Saving up now! What an awesome idea. I loved how you made something so basic into something spectular. Great tutorial. I'm actually going to Disney this year and my son who is a big Avengers fan would love this. I didn't know you could decorate them and they would still work! What a cute and creative idea.